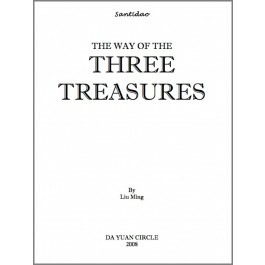 The Way of the 3 Treasures (santidao) is described in the Chinese Tradition in various ways. In Liu Ming’s compendium of teachings they are related to the human complex of jing (body), qi (movement) and shen (complete experience). The text has sections on Chinese astrology, traditional Chinese medicine (particularly food and herbs), exercise (san ti neigong) and the Daoist practice of non-conceptual meditation (zuowang). Three Treasures is a very thorough and practical guide for living in sync with the seasons. The recipes are delicious! The food and herb energetic index guide is very helpful and easy to use. This text has once and for all cleared up the notion of true spiritual practice for me. Tying together food, exercise and meditation … the “View” teachings are simultaneously profound and practical. I go back to this text again and again. I have recommended it to all my patients and found that those who use it respond more readily to treatment. The presentation is beautifully modest. In the 20th century what is left of the Chinese Contemplative Tradition is fragments of various Methods without a cohesive View. After 40 years of study and practice this text is my effort to put some fragments back in order. I hope it will inspire a deeper experience of this great tradition for those who have only a few fragments.